Background Triathlon is an increasingly popular sport at both the elite and the recreational level. However, there have been few high-quality studies of injuries and illnesses among triathletes. Objective To register overuse problems and acute injuries among iron-distance triathletes throughout a training season leading up to a major event. Methods A 26-week prospective cohort study was conducted including 174 participants of the 2011 Norseman Xtreme Triathlon. Data on overuse injuries located in the shoulder, lower back, thigh, knee and lower leg were collected every second week using the Oslo Sports Trauma Research Center Overuse Injury Questionnaire. Illnesses, acute injuries and overuse problems affecting other anatomical areas were also recorded using standard injury surveillance methods. Results The average prevalence of overuse problems was 56% (95% CI 51 to 61) (490 cases). The average prevalence of substantial overuse problems was 20% (95% CI 18 to 21) (165 cases). The most prevalent sites of overuse problems were the knee (25%), lower leg (23%) and lower back (23%). The acute injury incidence was 0.97 injuries per 1000 h of training (36 cases) and 1.02 injuries per 1000 h of competition (5 cases). A majority of moderate and severe acute injuries were located at the knee, shoulder/clavicle and sternum/ribs. The predominant types of acute injuries were contusions, fractures and sprains. The incidence of illness was 5.3/1000 athlete-days (156 cases). Conclusions Overuse problems constitute the majority of injury cases among iron-distance triathletes, and are far more common than acute injuries and illnesses. The most prevalent sites of injury in the present study were the knee, lower leg, lower back and shoulder. Future injury prevention studies in iron-distance triathletes should focus on these areas. Triathlon is a competitive sport consisting of swimming, bicycling and running. Since its incipience in the late 1970s, triathlon has grown into a popular endeavour among recreational and elite athletes, and it has been an Olympic sport since 2000. Common race distances include sprint distance (750 m swim, 20 km bike and 5 km run), standard or ‘Olympic’ distance (1500 m swim, 40 km bike and 10 km run), and long distance (3000 m swim, 80 km bike and 20 km run). In recent years, there has been a particular increase in the popularity of ultradistance triathlons (3.8 km swim, 180 km bike and 42.2 km run), also commonly known as ‘ironman’ or ‘iron-distance’ triathlons. However, little is known about the extent to which iron-distance triathletes suffer from injury and illness. This is important information as it represents the first step in the sequence of prevention research.1 ,2 Previous studies of injuries in triathlon have been limited by a retrospective study design or by a short duration and small sample size. Inconsistent injury definitions have also been used, making it difficult to compare and interpret results.3 According to Gosling et al3 this represents a gap in the knowledge needed to develop informed injury prevention strategies, thereby reducing the burden of triathlon-related injury. To our knowledge, there have been no previous epidemiological studies of illness in triathlon. All athletes who registered for participation in the 2011 Norseman Xtreme Triathlon (n=274) were contacted by email and invited to participate in the study. Among the 274 invited participants, 174 accepted the invitation. Norseman Xtreme Triathlon is an iron-distance event held annually in Norway with participants from all over the world. Information about the study was published on the organiser's website and in the online consent form that participants were required to complete. The study was approved by the Norwegian Data Inspectorate and reviewed by the South-Eastern Norway Regional Committee for Research Ethics. Every second Sunday for the duration of the 26-week data collection period, online survey software (Questback V. 9692, Questback AS, Oslo, Norway) was used to send each participant an email linking them to an injury questionnaire (described below). Athletes who failed to respond within 5 days received an automatic reminder email. The Oslo Sports Trauma Research Center (OSTRC) Overuse Injury Questionnaire was used to collect data on injuries located in the shoulder, lower back, thigh, knee and lower leg.5 These areas were selected for specific study as previous studies of triathlon injuries have suggested that the lower limb, back and shoulder are the most common sites of injury among iron-distance triathletes.3 In addition to questions on injury, athletes were asked to register the total training volume (hours) and training volume and the average training intensity in each discipline (swim, bike, run). In order to be able to provide accurate information, athletes were encouraged to keep a daily record of their training and injuries/physical complaints. The number of days of total time loss was registered for each problem reported. Baseline data were collected in the first questionnaire. The complete questionnaire is available as an online supplement to this paper. A severity score of 0–100 was calculated for each anatomical area each time a questionnaire was completed.5 This score was monitored over the duration of the study and the average score was calculated for all reported cases. At the end of the questionnaire, athletes were asked to record all physical complaints they had experienced in the previous 2-week period, regardless of the injury's consequence or whether they had already given information on the same problem in earlier questions. The nature of onset was recorded for each complaint and those that could be linked to a specific injury event (eg, a collision or fall) were classified as acute injuries. These injuries were reported according to the consensus statement on injury definitions and data collection procedures in studies of football (soccer) injuries.6 If an acute injury had been sustained in the shoulder, lower back, thigh, knee or lower leg, data corresponding to these injuries that were obtained through the overuse injury questionnaires were separated in the database. Athletes were asked whether or not they had suffered from illness during the previous 2-week period. Illnesses were defined as any health problems that were not related to the musculoskeletal system, for example respiratory tract infections, influenza or gastrointestinal infections. The number of days of time loss was recorded for all cases. All data were compiled in a database created with Microsoft Excel software (Microsoft Excel 2010, Microsoft Corporation, Washington, USA). At the conclusion of the study, a final classification of illness and injury cases was performed based on the total information obtained from each athlete over the course of the study. The rate and severity of overuse injuries was reported for each anatomical area according to the OSTRC methodology.5 As previously recommended, data from the first questionnaire were removed from all injury and illness analyses.5 Measures included the average prevalence of all overuse problems, the average prevalence of substantial overuse problems (defined as those leading to moderate or severe reductions in training volume, or moderate or severe reduction in sports performance, or complete inability to participate in sport) and the average severity score. The number, severity and incidence of acute injuries and overuse injuries affecting anatomical areas other than the shoulder, lower back, thigh, knee and lower leg were reported using standard methods.6 Illnesses were reported using the same methodological approach, but without any system-specific classification. The participant characteristics are summarised in table 1. The average male athlete had been generally active in sports for 23 years (95% CI 21.3 to 24.7). The female athletes reported an average of 18 years’ (95% CI 14.8 to 21.2) experience from active sports. Forty per cent of the female athletes and 36% of the male athletes were training for their first iron-distance race. Within the cohort, 16 athletes were classified as ‘elite’ as they had qualified for the event through seeding. There were no female elite athletes in the study. We invited 274 athletes to participate in the study, of which 63.5% (174) accepted the invitation. 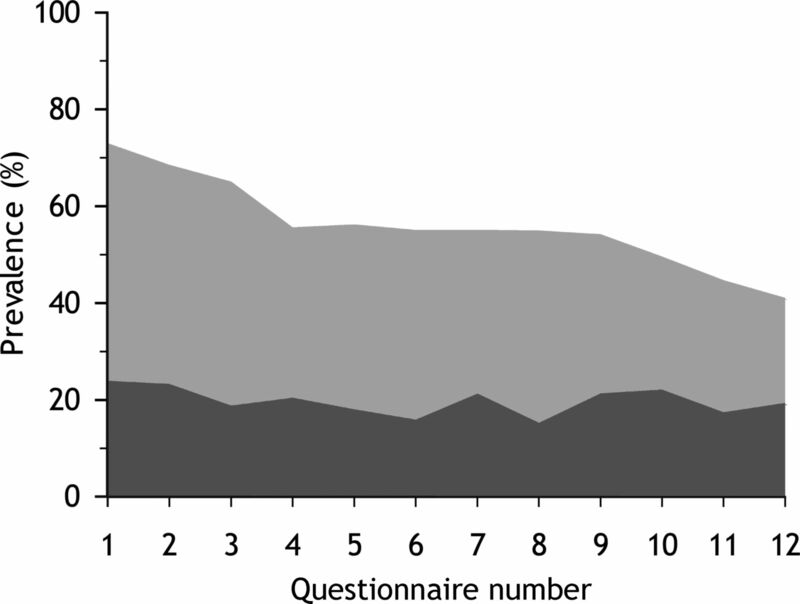 Among these, the average response rate to the electronic questionnaire distributed every second week throughout the course of the study was 87% (SD 4), whereas 112 (64%) completed all 13 questionnaires. We suggest that there were no significant differences between the responders and those with missing data, except for years of triathlon experience (5 years (SD 5.3) vs 3 years (SD 3.2), respectively, p=0.02) and number of completed iron-distance races (2.6 (SD 3.4) vs 1.5 (SD 2.1), p=0.02). On average, athletes spent 276 h in training during the 26-week study period (95% CI 263 to 289). Also, athletes, on average, trained for 11.1 h/week (95% CI 10.6 to 11.6, range 5.1–20.3). Of this, 1.4 h/week were spent swimming (95% CI 1.3 to 1.6, range 0–5.2), 5.8 h cycling (95% CI 5.4 to 6.2, range 1.1–13.2) and 2.9 h running (95% CI 2.7 to 3.2, range 0.7–10.6). Over the course of the 26-week project, 48% of the total training time was spent on cycling, 24% on running, 12% on swimming and 16% on other training such as weightlifting, skiing or other activities. Prevalence of overuse injury over 22 weeks prior to and 2 weeks after Norseman. Light grey area: all complaints, dark grey area: substantial problems. The average prevalence of overuse injury problems in any anatomical location was 56% (95% CI 51 to 61). The average prevalence of substantial overuse injury problems was 20% (95% CI 18 to 21) (figure 1). The average prevalence and severity score measures for the five different anatomical regions are shown in table 2. Eighty-seven per cent of the entire cohort reported some form of overuse problem at some point over the course of the study, and more than half reported substantial problems. On average, those athletes with shoulder problems reported problems 42% (95% CI 35 to 49) of the time throughout the course of the study. Athletes with knee problems reported problems 44% (95% CI 38 to 50) of the time. Those with lower back problems reported problems 46% (95% CI 39 to 53) of the time. Athletes with lower leg problems reported problems 47% (95% CI 40 to 54) of the time, whereas those with thigh problems reported problems 34% (95% CI 27 to 42) of the time throughout the course of the study (figure 2). Prevalence of overuse injury for the five main anatomical areas over 22 weeks prior to and 2 weeks after Norseman. Light grey area: all complaints, dark grey area: substantial problems. Overuse problems affecting anatomical areas other than the shoulder, knee, lower back, thigh or lower leg are shown in table 3. Forty-one acute injuries resulting from either training or competition were registered during the study period. The acute injury incidence was 0.97 injuries per 1000 h of training (36 injuries) and 1.02 injuries per 1000 h of competition (5 injuries). Seventy-eight per cent of the training-related acute injuries occurred while training in primary sport (swim, bike or run), while the remaining 22% resulted from alternative training. The predominant types of injuries were contusions (17%), fractures (10%) and sprains (10%). The location and severity of acute injuries are listed in table 4. The inciting events of the vast majority of acute injuries, 25 injuries sustained by 12 athletes, were bike accidents, where the athlete either collided with another cyclist or motor vehicle or lost control over the bike for other reasons. Injuries sustained in bike accidents most commonly affected the knee (7), shoulder/clavicle (4), head/face (3) and sternum/ribs (3), but injuries to the finger, forearm, elbow, hip, thigh, lower leg and ankle were also reported. One-third of the athletes involved in bike accidents suffered multiple injuries. None of the reported acute injuries were associated with swimming, and there were only three acute injuries associated with running; one ankle sprain, one strained thigh muscle during normal running and one contusion of the anterior iliac crest caused by a fall onto a rock. There were 156 cases of illness reported during the study period, affecting 104 athletes (60% of the cohort), giving an incidence of 5.3 illnesses/1000 athlete-days. Nine per cent of all cases did not lead to any time loss, 34% were of minimal severity (1–3 days of time loss), 36% were mild cases (4–7 days), 19% were of moderate severity (8–28 days) and 3% of all cases were of more than 28 days’ severity. To our knowledge, this is the first prospective cohort study of injuries and illnesses among iron-distance triathletes. The major findings were that, at any given time during the course of the study, more than half the cohort were suffering from some form of overuse problem and one in five had overuse injuries causing a moderate to severe reduction in training participation or sports performance, or complete inability to train (substantial overuse problems). Five specific anatomic areas were investigated in this study: the shoulder, lower back, thigh, knee and lower leg. While overuse symptoms were prevalent in all locations, the knee and lower leg were the areas with the highest prevalence of substantial problems. A total of 87% of the entire cohort reported some form of overuse problem at some point over the course of the study, and more than half reported substantial problems. This suggests that the magnitude of overuse problems in iron-distance triathletes is high, supporting the conclusions of previous reports.7–17 However, as we have used a new method of collecting and expressing injury data, our results are not directly comparable with previous triathlon studies. In addition to the area-specific questionnaires, injuries were also registered using ‘standard’ surveillance methods, in which a more open form of questioning was used. Using this method, only 18 overuse injuries affecting anatomical regions other than our five main areas of interest were identified. This may partly be due to the differences in methodology applied, as general questioning has a tendency to lead to fewer cases of overuse problems being identified compared to specific questioning on predefined anatomical areas.19 However, it seems reasonable to conclude that the five anatomical areas we specifically studied covered a majority of the overuse injuries affecting the cohort. Ankle/foot/toe injuries have previously been reported to constitute between 9% and 35% of all injuries sustained by triathletes, thus being the second most common site of injury in the lower limb.11 ,14 However, we found ankle/foot/toe injuries to account for only 3% of all our recorded injuries. Acute injury data were reported to be consistent with current consensus methodology.6 ,20 In contrast to previous reports,3 we found a low incidence of acute injuries related to triathlon competition (1.0 injuries per 1000 h of competition). In comparison, previous studies have reported up to 17.4 injuries per 1000 h of competition.15 The most likely explanation for this discrepancy is that previous studies have included all injuries, including exacerbations of pre-existing overuse conditions, in their incidence measures. In contrast, owing to the prospective design of this study, we were able to identify and eliminate pre-existing conditions from incidence calculations. No epidemiological studies have reported illnesses among triathletes. Our findings suggest that the incidence of illnesses among iron-distance triathletes is similar to that in other individual sports,21–23 and considerably lower than in team sports.24–28 However, our data showed a decline in illness incidence towards the main competition. This finding may be due to normal seasonal variation, but might also suggest that the incidence of illness is lower close to competition than in the training season. Previous studies reporting the incidence of illnesses among athletes of individual sports have only captured data over the duration of a tournament. The prevalence of overuse problems in iron-distance triathletes is high, whereas the acute injury incidence appears to be lower than reported previously. The incidence of acute injuries did not differ between training and competition. The findings of this study suggest that overuse problems constitute the majority of injury cases in iron-distance triathletes, with the most prevalent sites of injury being the knee, lower leg, lower back and shoulder. Future injury prevention studies in iron-distance triathletes should focus on these areas. The majority of injury cases in iron-distance triathletes are due to overuse. The incidence of acute injury is low in iron-distance triathlon for both training and competition. The knee, lower leg, lower back and shoulder are the most prevalent sites of overuse injury in iron-distance triathletes, and future injury prevention studies should focus on these areas. This paper introduces a new methodology for overuse injury registration in triathlon injury surveillance, which may lead to progress in the field of triathlon injury epidemiology. The results from the present study shed new light on the burden of triathlon-related injury, and may contribute to future informed development of injury preventive strategies. The authors would like to thank Hardangervidda Triatlon Klubb, the organiser of Norseman Xtreme Triathlon, for their assistance in recruitment of participants and promotion of the project. We would also like to thank the athletes for their patience and faithful reporting throughout the study period. The Oslo Sports Trauma Research Center has been established at the Norwegian School of Sport Sciences through generous grants from the Royal Norwegian Ministry of Culture, the South-Eastern Norway Regional Health Authority, the International Olympic Committee, the Norwegian Olympic Committee & Confederation of Sport, and Norsk Tipping AS.
. A new framework for research leading to sports injury prevention. J Sci Med Sport 2006;9:3–9; discussion 10.
. Triathlon related musculoskeletal injuries: the status of injury prevention knowledge. J Sci Med Sport 2008;11:396–406.
. Development and validation of a new method for the registration of overuse injuries in sports injury epidemiology: the Oslo Sports Trauma Research Centre (OSTRC) Overuse Injury Questionnaire. Br J Sports Med 2013;47:495–502.
. Triathlon event distance specialization: training and injury effects. J Strength Cond Res 2010;24:30–6.
. Triathlon. Phys Med Rehabil Clin N Am 2006;17:553–64.
. Back and neck pain in triathletes. Neurosurg Focus 2006;21:E7.
. Analysis of injuries in long-distance triathletes. Int J Sports Med 2003;24:271–6.
. Factors associated with triathlon-related overuse injuries. J Orthop Sports Phys Ther 2003;33:177–84.
. Injury and training characteristics of male elite, development squad, and club triathletes. Int J Sports Med 1998;19:38–42.
. Low back pain and other overuse injuries in a group of Japanese triathletes. Br J Sports Med 1996;30:134–9.
. An epidemiological investigation of training and injury patterns in British triathletes. Br J Sports Med 1994;28:191–6.
. Overuse injuries in ultra endurance triathletes. Am J Sports Med 1989;17:514–18.
. Overuse injuries in professional road cyclists. Am J Sports Med 2010;38:2494–501.
. Illness during the 2010 Super 14 Rugby Union Tournament—a prospective study involving 22 676 player days. Br J Sports Med 2012;46:499–504.
. Sports injuries and illnesses during the second Asian Beach Games. Br J Sports Med 2012;46:780–7. Contributors CAA and TJ were responsible for co-ordination of the data collection. CAA and BC were responsible for data analysis. LE was the project manager of the study. He participated in the planning of the study and reviewed the manuscript critically. CAA is responsible for the overall content as the guarantor. All authors were involved in planning the project and preparing the manuscript. Ethics approval South-Eastern Norway Regional Committee for Research Ethics. Data sharing statement All unpublished data are available upon request.